If you have any questions about the KERI LEE information page below please contact us. Being built by the Richmond Yachts shipyard in Canada the KERI LEE is 42 m 138 (ft) in length. Finished and launched by 2004 her interior design exhibits the unique vision in the designing of Pavlik Yacht Design. Superyacht KERI LEE is able to accommodate up to 12 passengers with 8 crew members. The former names or project names were Status Quo. She is able to attain a top speed of 21 knots. Sovereign Yachts was the naval architect firm involved in the professional vessel design work for KERI LEE. 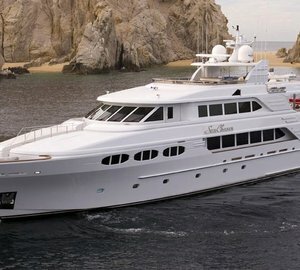 Also the company Sovereign Yachts and Setzer Design Group successfully collaborated on this undertaking. Interior designer Pavlik Yacht Design was employed for the internal interior ambience. In 2004 she was actually launched to celebration in Richmond Bc and post sea trials and final completion was afterwards delivered to the owner. 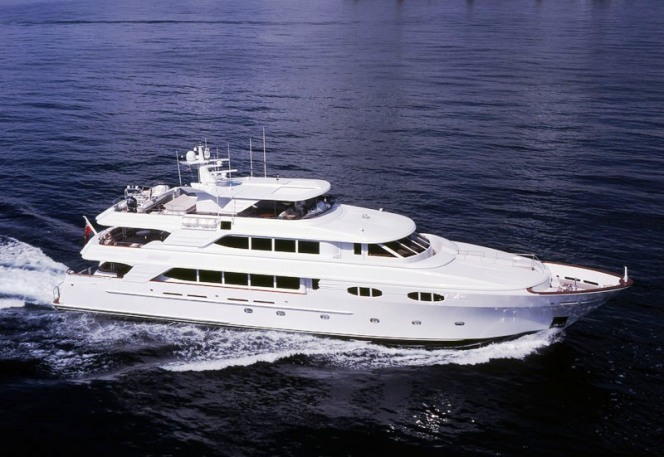 Richmond Yachts completed their new build motor yacht in Canada. Her core hull was constructed with composite. The motor yacht superstructure component is made largely with composite. With a beam of 8.55 metres / 28 ft KERI LEE has fairly large size. A reasonably shallow draught of 2.2m (7.3ft) limits the amount of worldwide harbours she can enter, taking into account their minimum depth. The 3512 engine installed in the motor yacht is produced by CATERPILLAR. She is driven by twin screw propellers. The main engine of the yacht creates 2249 horse power (or 1678 kilowatts). She is fitted with 2 engines. The sum thrust for the boat is accordingly 4498 HP or 3356 KW. Bestowing room for a maximum of 12 visiting passengers spending the night, the KERI LEE accommodates them comfortably. This ship has room for approximately 8 proficient crew members to manage. 21 nautical miles per hour. Range in nautical Miles is 3000 at a speed of 15 knots. KERI LEE features a teak deck. The luxury yacht KERI LEE displayed on this page is merely informational and she is not necessarily available for yacht charter or for sale, nor is she represented or marketed in anyway by CharterWorld. This web page and the superyacht information contained herein is not contractual. All yacht specifications and informations are displayed in good faith but CharterWorld does not warrant or assume any legal liability or responsibility for the current accuracy, completeness, validity, or usefulness of any superyacht information and/or images displayed. All boat information is subject to change without prior notice and may not be current.